The Internet of Things (IoT) has not been around for very long. However, there have been visions of machines communicating with one another since the early 1800s. Machines have been providing direct communications since the telegraph (the first landline) was developed in the 1830s and 1840s. Described as “wireless telegraphy,” the first radio voice transmission took place on June 3, 1900, providing another necessary component for developing the Internet of Things. The development of computers began in the 1950s. The Internet, itself a significant component of the IoT, started out as part of DARPA (Defense Advanced Research Projects Agency) in 1962, and evolved into ARPANET in 1969. In the 1980s, commercial service providers began supporting public use of ARPANET, allowing it to evolve into our modern Internet. Global Positioning Satellites (GPS) became a reality in early 1993, with the Department of Defense providing a stable, highly functional system of 24 satellites. This was quickly followed by privately owned, commercial satellites being placed in orbit. Satellites and landlines provide basic communications for much of the IoT. One additional and important component in developing a functional IoT was IPV6’s remarkably intelligent decision to increase address space. Steve Leibson, of the Computer History Museum, states, “The address space expansion means that we could assign an IPV6 address to every atom on the surface of the earth, and still have enough addresses left to do another 100+ earths.” Put another way, we are not going to run out of internet addresses anytime soon. The Internet of Things, as a concept, wasn’t officially named until 1999. One of the first examples of an Internet of Things is from the early 1980s, and was a Coca Cola machine, located at the Carnegie Melon University. Local programmers would connect by Internet to the refrigerated appliance, and check to see if there was a drink available, and if it was cold, before making the trip. By the year 2013, the Internet of Things had evolved into to a system using multiple technologies, ranging from the Internet to wireless communication and from micro-electromechanical systems (MEMS) to embedded systems. The traditional fields of automation (including the automation of buildings and homes), wireless sensor networks, GPS, control systems, and others, all support the IoT. 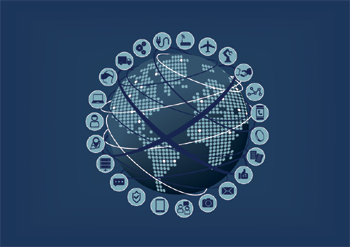 Simply stated, the Internet of Things consists of any device with an on/off switch connected to the Internet. This includes almost anything you can think of, ranging from cellphones to building maintenance to the jet engine of an airplane. Medical devices, such as a heart monitor implant or a biochip transponder in a farm animal, can transfer data over a network and are members the IoT. If it has an off/on switch, then it can, theoretically, be part of the system. The IoT consists of a gigantic network of internet connected “things” and devices. Ring, a doorbell that links to your smart phone, provides an excellent example of a recent addition to the Internet of Things. Ring signals you when the doorbell is pressed, and lets you see who it is and to speak with them. Kevin Ashton believed Radio Frequency Identification (RFID) was a prerequisite for the Internet of Things. He concluded if all devices were “tagged,” computers could manage, track, and inventory them. To some extent, the tagging of things has been achieved through technologies such as digital watermarking, barcodes, and QR codes. Inventory control is one of the more obvious advantages of the Internet of Things. When thinking of the IoT, consider the idea, “any device capable, can be interconnected with other devices.” The IoT is ripe for new and creative ideas to add to the tasks already in use. Imagine an alarm waking you at 6 AM in the morning, and then simultaneously signaling your coffee maker to turn on and start brewing coffee. Imagine your printer knowing when you are running low on paper, and automatically ordering more. Imagine the watch on your wrist telling you “where” you have been the most productive, while at work. The IoT can be used to organize such things as transportation networks. “Smart cities” can use it to reduce waste and maximize the efficient use of energy. In truth, the IoT provides a nearly endless supply of opportunities to interconnect our devices and equipment. In terms of creativity, this field is wide open, with an infinite number of ways to “interconnect the devices.” It can be an exciting time for innovative individuals, in part, because we don’t fully understand the impact of these interconnections. The IoT offers both opportunities and potential security problems. At present, the Internet of Things is best viewed with an open mind, for purposes of creativity, and a defensive posture for purposes of privacy and security. As sensors and video cameras become more common place, especially in public spaces, consumers have less and less knowledge about the information being collected, and no way to avoid it. Many people are uncomfortable with the idea of companies collecting information about them, and even more uncomfortable having that information sold to anyone and everyone. Generally speaking, older people dislike having information about themselves collected more than younger people, but according to one survey, about 45% of “all” respondents did not trust companies to use the data they collected to protect their privacy. Currently, choices regarding privacy are very black and white, or on/off. The customer is forced to give up all privacy, (often in an agreement so convoluted people don’t bother to plow through it) or the customer simply cannot access the service. This has led to continuing discussions about consumer privacy and how to best educate consumers regarding privacy and the accessibility of data. While there are steps to take to help ensure security, it should come as no surprise this issue has become a significant concern with the growth of the IoT. Literally billions of devices are being interconnected together, making it possible (eventually) for someone to hack into your coffee maker, and then access your entire network. The Internet of Things also makes businesses all around the world more open to security threats. Additionally, data sharing and privacy becomes issues when using the Internet of Things. Consider how concerns will grow when billions of devices are interconnected. Some businesses will be faced with storing the massive amounts of information these devices will be producing. They will need to find a method of securely storing the data, while still being able to access, track, and analyze the huge amounts of it being generated. James Lewis, who is a cybersecurity researcher for the Center for Strategic and International Studies, has written a report describing how the Internet of Things’ interconnections will allow computer hackers to wreak havoc through interconnected devices. The threat is so real, even the Federal Trade Commission has gotten involved, wanting to know how to guarantee privacy, and how security safeguards are being installed in new Internet-connected devices. For example, new cars can now be hijacked by way of their Wi-Fi connections. Consider the threat of hackers when automated driving becomes popular. Security and risk management should not be taken lightly when creating new ways to use the Internet of Things.